Discussion in 'Shrimps and Crabs' started by Juli Harvey, Apr 13, 2017. Ok. 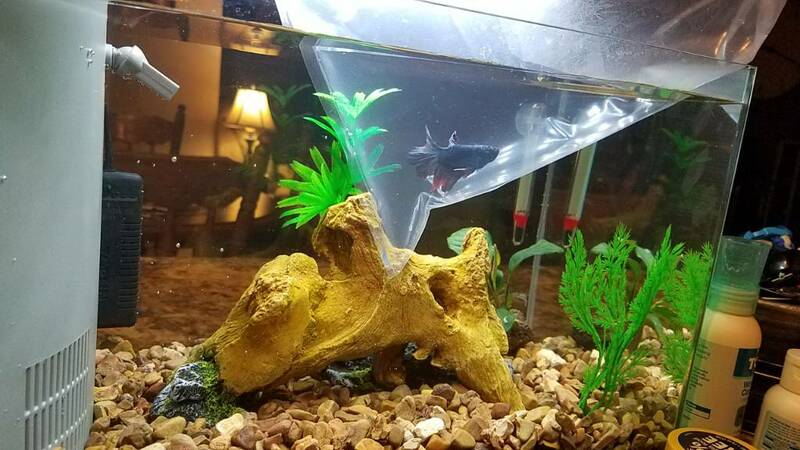 I have this nifty little 5 gallon aquarium cycling (the Betta is no longer in there) and was thinking about some shrimp. However it had an integrated filter system with this kind of intake. How would I keep the shrimp from being sucked into the filter? What kind of filter do you have? I have HOB filters and mine never go near them. Also, I never have had any get sucked through the intake. It's probably possible though. You can see in the bottom left the grate to the filter. Well, I've never purchased that model, so I can't give you a guarantee. You should be okay. If it doesn't work out it doesn't work out. Good luck!! We had that kind of filter intake and the shrimp used to sit on it to clean it off, even the littlest of fry didn't seem to have a problem with it. Our other HOB intake we put a mesh around it to make sure no one was sucked up, I found a couple swimming around in the filter once. I don't know the model you have but for us that type worked great for shrimp. Shrimp Safe Cover For Filter Intake?